Seasons come and seasons go, and no matter the outcome, I’m always little sad to see it come to an end. This post is to say thank-you.Thank-you, for the season that was and all that is to come in the future. Was the season perfect? No, but that doesn’t mean it was a wasted season. There will be some who say that this entire season was a write off or that it was pointless from the time that Brock Boeser’s injury took him out of the lineup or that you didn’t tank properly by winning games down the final stretch. Some will say that there were no strides made or that the lineup was a disaster. Yes, it’s true that this season had some really hard moments from an endless list of long-term injuries to seeing Derek Dorsett forced to make the decision to leave the game early. Despite all those hard things or the negatives, there were still some pretty incredible moments that leave hope and excitement for the future. This season wasn’t perfect but it definitely wasn’t a write off or pointless. Prospect development has been exciting to see grow in depth the past few seasons. This year you boasted one of your strongest prospect pools with players such as: Adam Gaudette, Kole Lind, Olli Juolevi, Elias Pettersson, Jonathan Dahlen, Petrus Palmu, Thatcher Demko, Michael Dipietro etc; all who have had success in their perspective leagues. As you know, fans have long been begging for youth to be infused into the lineup and this year we saw quite a bit of youth in the lineup over the course of the season. Brock Boeser a player that came with a lot of expectations on himself and from the fans. Is it possible that he could live up to the hype? In just his first full season, he made it clear very early that he’d exceed any and all expectations. Every game he was a part of, he drove to the net and boasted a wrist shot that rivals Pavel Bure or Markus Naslund, leaving many goalies to ask: “HOW?”. It never seemed to matter who he played with, he always found a way to get the goals. Had he not been injured, he probably would’ve set an all-new Canucks rookie scoring record. After his first 20-goal season, everyone wondered if Bo Horvat could repeat the feat? He answered that with a resounding YES, DESPITE missing extended time due to a foot injury, he put up a second 20-goal season! Every time he was on the ice, he was determined and worked on the smaller details of his game as well. You can see his determination every single shift. How fun was that line of him, Boeser and Baertschi early in the year before the injuries hit? Jake Virtanen took strides this year to find that extra gear that everyone hoped he had. The last two months of the season in particular, he brought consistency to his game in all areas. That hard work he put in while being coached in Utica last season, has brought a new level to his game. Thatcher Demko. Call him up, they said. Let him play, they said. CALL HIM UP. And then it happened, you called him up and not just to sit on the bench but to make his NHL debut in front of the home crowd. DEMKO TIME had arrived and what a game it was full of highway robbery saves finished with a thriller overtime win. Darren Archibald came into to the season looking for his second chance in the NHL. With a strong training camp, and a continued strong playing style with Utica, he earned his spot late in the season. It was so great to see his hard work these last few years pay off with him getting back into the NHL. Proving that working hard and never giving up on your dream is always worth it. Derek Dorsett came into this season after a long recovery from his injury last season and was swinging on all cylinders on pace for a career year. It was all kinds of magic to see him have such success after such a tough year last season. To see how hard he had worked to get here and then to see him have to make one of the toughest calls was heart-wrenching. It was absolutely the right call to make but still heartbreaking to see the decision be earlier than he had planned. Heck of a career that left a lot of people inspired. And then it happened, the announcement that everyone had been both anticipating and hoping wouldn’t actually happen. Henrik and Daniel Sedin, have for the last 18 years defined what it meant to be a Canuck both on and off of the ice. This season we witnessed history as a second player notched his 1000th career point with the franchise. How often is it that one let alone TWO players each put up 1000 points with ONE franchise? It’s a rare feat and absolutely incredible to have happened twice over the last two seasons. That final home game from the Sedins was a perfect send off to end their tenure with the team. It was an absolutely incredible opportunity for the fans to have the chance to express our thanks to Henrik and Daniel. It’s the end of an incredible era but also the beginning of a new one full of promise and hope. It was a year full of ups and downs and everything in between. Thank-you for another memorable season in the books. Here’s to the future! Happy off-season all, I have a treat to share with you! 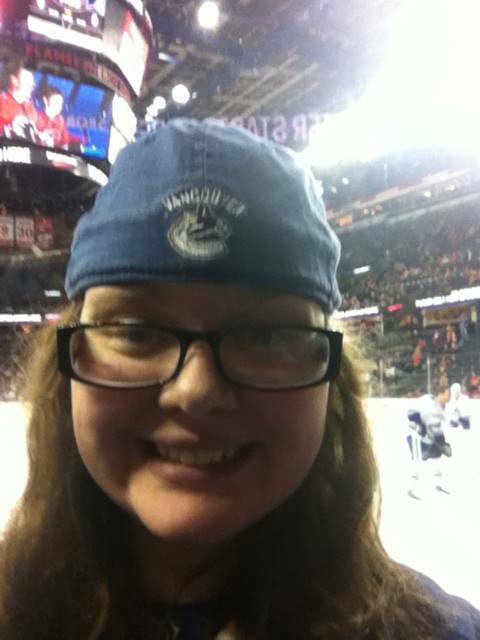 Today, I present to YOU, a special guest post from my great friend and fellow Vancouver Canucks fan: BRIEANN KNORR. (If you’re not already, make sure to follow her on twitter @BrieannKnorr). My Highlights of the 2017-18 season. The first highlight of the season for me started before the season actually began! I attended the 2017 Young Stars Tournament in Penticton. I have been going for a few years now and it always signifies the start of the season. It’s always such a treat to see some of the best prospects from the Western Canadian teams play. I also met a few of the Canucks prospects like Kole Lind and Olli Juolevi. The game was really fun and it really shows what depth the Canucks will have in a few years. But, the true highlight for me was after the game. We were walking up the stairs to leave the arena, and in front of me was this elderly gentleman who was needing some help getting up the stairs. I then saw this guy in a suit help this gentleman up and I thought, “wow that’s really nice!”, so I tried to tell this guy that I was impressed and thankful for his act of kindness, but no words came out. We ended up staring at each other for a few seconds. The guy looked familiar and I couldn’t place where I recognized him from, when we left the building, my sister asked me, “wasn’t that Brock Boeser?!”. Speaking of, what an insane season for Boeser! I didn’t see this type of season coming. Yes, it was cut short due to injury but I got excited for the future. For me, he came out of nowhere, I had seen him play last season and thought he was an amazing kid but he blew me away. The way he can shoot the puck and create scoring opportunities out of nothing is insane, its like the goalie isn’t even there. I also wasn’t expecting him to appear in an NHL All-Star game this year, but it was a fun time and I think the Canucks are finally getting the recognition they deserve. I can’t wait to see what happens next season with this kid. My next highlight is one that has yet to sink in. The retirement of Henrik and Daniel Sedin. I have never seen a Canucks team without them. 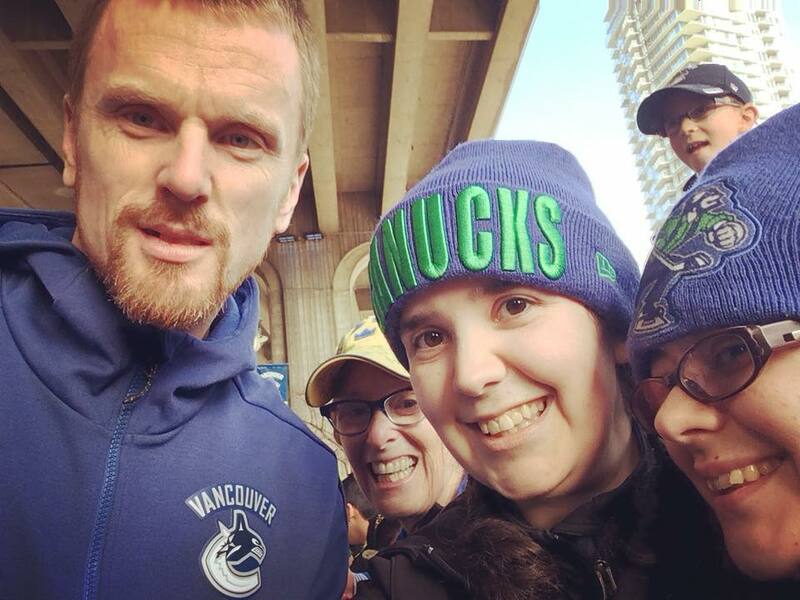 I started liking hockey when I was 8 in 2003, and since then I have always liked the Sedins. I am not ready for them to retire, but we must let them. What the Sedins have done for this team is beyond amazing. They have rewritten the history book both on the Canucks and in the NHL. The first brothers to each hit the 1000 points mark, winners of back to back Art Ross Trophies, and leading the Canucks to a Stanley Cup Final. The Sedins will also be remembered by their work off of the ice in the city of Vancouver. I have never seen two people who are so giving of their time and resources. 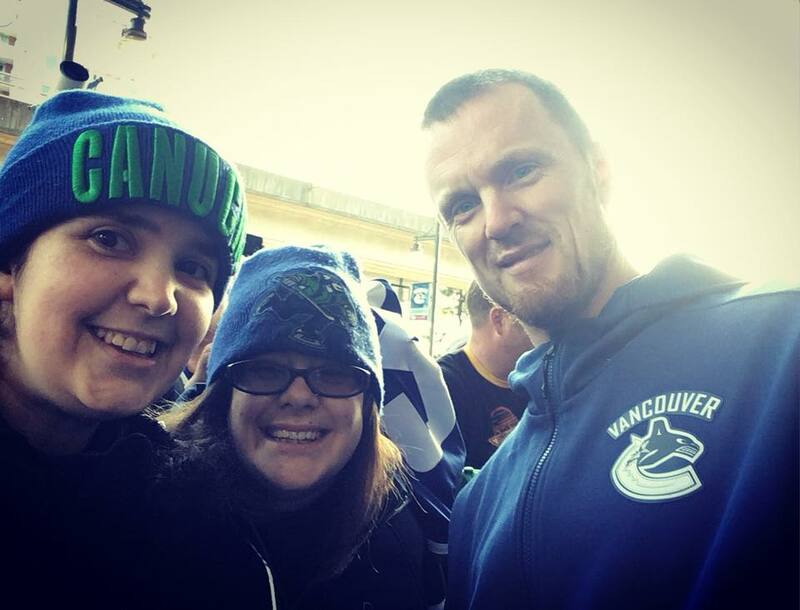 I have been reading a lot of stories about people’s experiences with the Sedins and they are nothing short of classy. They have always been quiet superstars, the ones that don’t want the spotlight or the attention. This is what made me like them. They taught me you can be good at something but not have an ego, that caring for others over yourself brings joy and not the other way around. I am sure going to miss them but all I say to them is thank-you. The last highlight of the season was the youth movement on this team. From Boeser, Archibald, Gaudette and Demko, the future is bright for this team. The Canucks have a lot of very good prospects coming up and I think this team is going to be very good. We just have to keep waiting and have some patience. This process will take a while, but I know the outcome will be worth it: a Stanley Cup. The day has finally come, a word I never thought I’d hear either Henrik or Daniel say out loud. Or perhaps, it’s one that I hoped would never be said. At the conclusion of the 2017-2018 regular season, the Sedins will be officially retiring from the NHL. Now that it’s officially, official; how do we as a city, as a fan base begin to thank-you for everything you’ve done? Is it even possible for us? For the last 18 seasons, the two of you have defined this team and mesmerized the NHL with your twin-tuition on the ice. Thank-you, thank-you, thank-you for 18 years of absolute magic, defying the odds, the ever persistent pursuit of your dream that became a reality and for inspiring SO many players and fans to also never give up. I wish that you could really know just big an impact you’ve made on the team, the franchise, on the city, the province and on the fans around the world. You made the coaches, your teammates, this city and every single Canucks fan beyond proud. How many brothers that have been blessed to play in the NHL, can say that they have played their entire careers side by side for the same franchise? How many can say that they won back to back Art Ross trophies as the league leaders in points? How many can say that they BOTH put up 1000+ points? We will savour these final three games. this final hurrah in your storied careers that are destined to be forever immortalized in the hockey hall of fame. Three more games for us to savour every last moment of Sedinery yet to come. Over the last 18 years. you’ve given everything you had and more to this team, this franchise, this city and the fans. Your dedication was never in question, you persevered through the good and the bad and always led by example. Leaders on and off of the ice. You defined what it meant to play with heart. And please know that going into this final stretch of your careers, that you NEVER once let this city down. And to THIS fan, to all Canucks fans, no matter what happens next on your journey or where your path takes you when this season comes to an end, you will always and forever be Canucks. Little did we know, that just two days later you would make an announcement that would both break our hearts and make them soar with pride that we’ve been lucky enough to witness your entire careers. There’s not been one game that I’ve attended at GM Place/Rogers Arena that both of you didn’t play. Picturing a Canucks team that doesn’t feature you at it’s heart, will take some time to adjust to. And while I’m excited for the team’s exciting potential down the road, I’ll never forget the two legends that paved the way for this new core. You’ve left an indelible mark that will forever be felt in the franchise and looked upon to remember that even when things get tough, all that needs to be done is to think back of how you both always kept pushing forward despite the odds and we will be reminded that when you tune out the negative, ANYTHING is possible. Thank-you doesn’t seem even close to enough but it’s what I have to offer. Henrik, and Daniel, THANK-YOU, for everything. And to all of YOU Canucks fans, let’s make Rogers Arena thunderously LOUD these final two home games of the season. Let’s show Henrik and Daniel just how much they’ve made a difference for all of us Canucks fans.